undercoat. They are not “hypoallergenic” dogs. How do they do in the Winter with Snow? 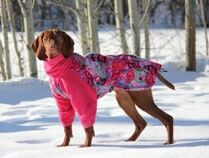 Winter can be problematic in colder climates as Vizslas don’t have the extra undercoat to keep them warm. In addition, their ears have a large surface area which also needs extra attention in extreme climates. Ours sometimes wear coats and also may have their ears cover when they are out for extended times in the cold. Deep soft snow is something to watch for too as the extreme jumping to get through it can damage their shoulders despite the fun they have playing in it. Why wait until 2 years of age to Spay or Neuter? Vizslas are high energy dogs that are slow to mature. Their growth plates close around 2 years of age. 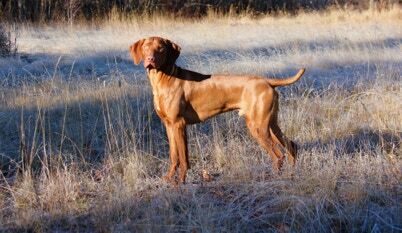 It is important Vizslas physically mature to their full potential to support their active lifestyle. Recent studies are finding detrimental health and behaviour effects on dogs when spayed or neutered early. Please Note: Having an intact dog requires responsible pet ownership. Do Vizslas make good running partners? They can but wait until they are fully mature (2 years of age) to avoid chronic injury or developmental injuries that can negatively affect them over their lifetime. After they are 2 years old, work up slowly to moderate distances, trail running is better due to the softer ground, always carry water for them and be aware of them over heating. Dogs cool off by panting and can only sweat through their paws. They can easily overheat putting them at risk for heat stroke and multiple organ distress. Watch paws too - some surfaces get extremely hot or cold. They can’t tell you how they are doing. Their love to do things with you will keep them going when their body really needs a break. Be your Vizsla’s best friend. Watch out for them and keep them safe.